Power Control, Real Time Clock & Temperature Sensor Module for the Raspberry Pi. Connect the on board PICs power input to an always on power e.g. an Pico, MiniITX or ATX's 'standby power' and then connect a momentary or latching On/Off switch to the board for power control like on a standard PC. Filing system access LED support available NOW for RISC OS on the Raspberry Pi. 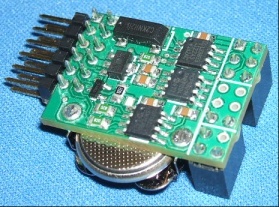 Battery backed up Real Time Clock card and Temperature Sensor also included. Physical installation: Plugs into the GPIO pins. Fits within the footprint of the Raspberry Pi's PCB and is lower than the USB sockets so should fit into almost any case. Full fitting instructions are on our main website. Battery Capacity: Over nine years! Raspbian "wheezy" now supports the Real Time Clock (see fitting instructions above for how to enable this). The official RISC OS downloads include Real Time Clock support now! We are current searching for Linux software for the temperature sensor, the MCP9801 is a commonly used chip that is software compatible with many other I2C temperature sensors. The temperature sensor hardware has been tested using RISC OS!